Embroidery, buttons, trimming and beading are all wonderful ways to add a final beautiful touch to your sewing project you might be lucky enough to have inherited a well-established button box and trimming collection, but if you are starting from scratch,keep your eye out at charity shops, flea markets and antique fairs. Once you start searching, you’ll be amazed at the treasures you can find! Below we also introduce some pretty embroidery stitches for you to experiment with. Embroidery is a lovely way to add a unique finishing touch to a hand-sewn project. Embroidery silks come in a broad range of colors. Each stitch can be used to give a different effect and with a little practice is fairly easy to achieve. 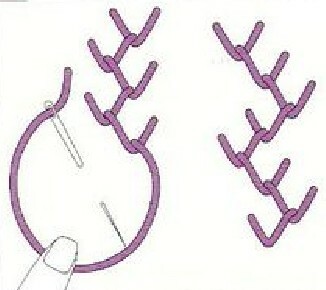 Stem stitch Stern stitch is very useful for creating an outline. Work from left to right along the design, taking small stitches. The needle and thread should always come out on the left side of previous stitch. Feather stitch Feather stitch is a beautiful decorative stitch that can be used as an edging. Bring the needle out at the top centre. Holding the thread down with your thumb. Insert the needle to the right on the same level and take a small stitch to the centre, keeping the thread under the needle point. Inserting the needle a little to the left on the same level. take a small stitch to the centre. Repeat these two stitches, alternating between left and right. 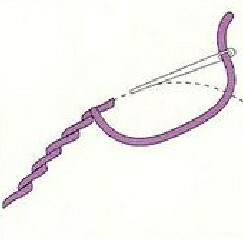 Back stitch Back stitch can be used for creating outlines or embroidering letters and numbers. Insert the needle onto the design. Take a back ward stitch and then bring the needle up a little way ahead of the first stitch. Insert the needle into the point where the first stitch began. 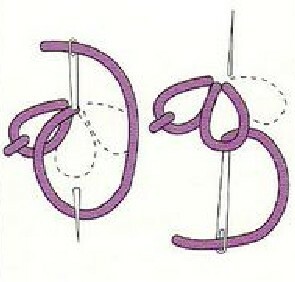 Chain stitch is a versatile decorative stitch, Bring the thread out and hold down with the left thumb. Insert the needle where it last emerged and bring the point out a little way in front. Pull through. Keeping the thread under the needle point to form the looped stitch. Herringbone stitchHere we use herringbone as a purely decorative stitch, but it can also be used for hemming. Bring the needle up on the lower line at the left side. Insert on the upper line to the right and with the thread below the needle. 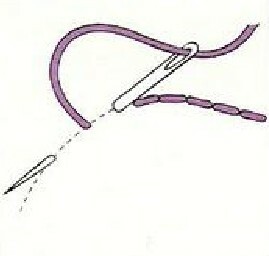 take a small stitch to the left Then insert the needle onto the lower line to the right with the thread above the needle and take another small stitch to the left Continue to the end. Lazy daisyLazy daisy is a delightful technique used to create simple flower designs. 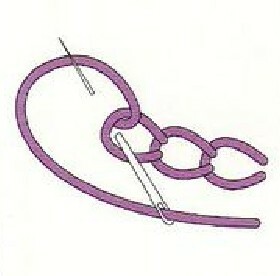 Work in the same way as chain stitch but fasten each loop at the foot with a snail stitch. Work in a group to create flower petals. French knots French knots can be used to give details to eyes, stamens or used in clusters to break up a surface. 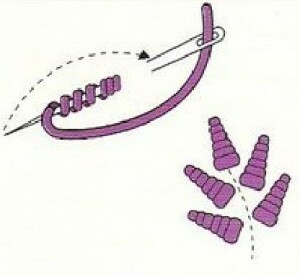 Bring the thread to the front and hold it down with the left finger and thumb. Twist the thread around the needle twice. Insert the needle close to wear the thread emerged and draw’ the thread tightly through creating a neat knot on the surface. Bullion stitchBullion stitch is similar to a French knot. But you may vary the length of the Knot. Insert the needle the appropriate distance from the original point. Bring it back up through the first point. 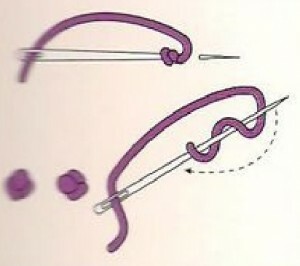 Keep the needle in the material and twist the thread evenly around the needle the required number of times. Tighten the coil by pulling the thread and insert the needle into the end of the knot. Couching stitch Couching stitch is an effective way of creating a bold line. 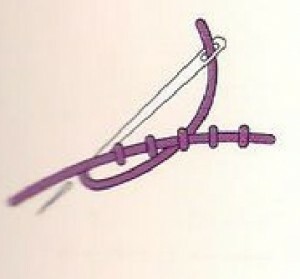 Lay a thread along the line of the design and with another thread, tie it down at even intervals with a small stitch.